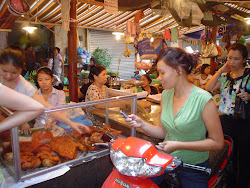 Luang Prabang's Night Market, located in Sisavangvong road. Luang Prabang Night Market is open every day from 17:00 until 22:00. The night market in Vientiane, Laos. The night market in the city of Vientiane that installs every night on the bank of Mekong river, a good place to buy in Laos.